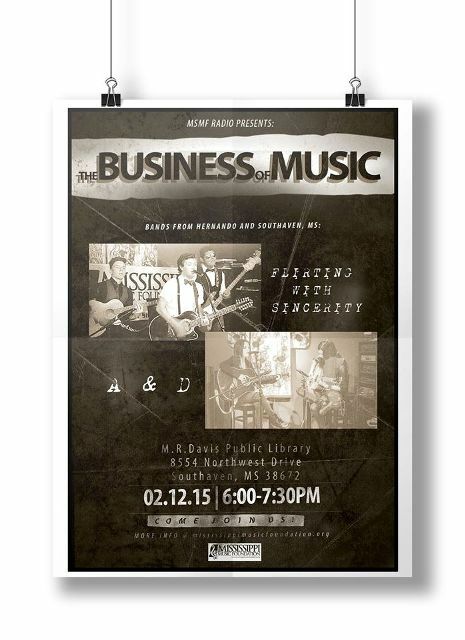 The Mississippi Music Foundation presents its new series “The Business of Music.” — Mississippi Music Foundation, Inc. The Mississippi Music Foundation presents its new series “The Business of Music.” Listen to trade secrets while industry professionals break down the keys to being a successful musician. Whether you are performing musicians, aspiring artists that have or are about to start a band, or a parent that sees a musical gift in your child, this is the seminar for you. The business of music focuses on both sides of the equation discussing principals that can easily be transferred to all types of business where you have to thoroughly understand your product, fan base and customers. Listen to Mississippi’s finest up and coming artists as we give you the information to help you achieve your goals. All shows are free to the public and start at 6:00pm ending at 7:30pm. We will be at M.R. Davis Public Library, 8554 Northwest Drive , Southaven, MS . Get your advanced ticket by liking us at http://www.spreaker.com/user/msmf-radio and send an email to sjones.mmf@gmail.com.